The Pacific War Online Encyclopedia: Pownall, Charles A. "Baldy" Pownall had commanded Enterprise shortly after her shakedown cruise and was credited with bringing the ship to a high level of efficiency. During the Pacific War, he was given command of the first fast carrier task group formed from the newly-constructed Essex and Independence-class carriers. However, he had no previous combat experience, and he handled his force unaggressively during its first raid on Marcus Island and on subsequent raids into the Gilberts and Marshalls. You've got the widest yellow streak up your back of any admiral I've ever seen in my life.... I don't care if when I return to Pearl I don't have a ship and I don't have a command. You can make me a seaman second tomorrow, but this is my ship and I'm going to send out a search for them! (Tuohy 2007) Clark received permission to carry out the search, which was fruitless, but which endeared him to his aviators. During the Marshalls raids of December 1943, Pownall refused to launch a second strike against G4M "Betty" bombers spotted on the runway at Roi-Namur. Lexington was later damaged by a torpedo from one of these aircraft. Clark subsequently circulated an anonymous critique of Pownall's performance. 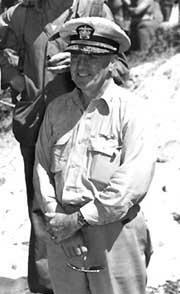 John Towers, Nimitz' air chief, assessed Pownall as "Overcautious in plans and operations. He worries intensely before and during operations. Lack of aggressiveness resented by subordinates." Pownall's chief of staff was of the opinion that "Pownall knew his business but he just wasn't aggressive enough." According to Tillman (2012), Pownall was too polite to wield authority effectively and of too gentle a disposition to face the reality of casualties. Pownall was relieved in early 1944 by Marc Mitscher on Nimitz' orders. However, he was given command of Naval Air Forces, Pacific Fleet, an important administrative post, as a face-saving gesture. Pownall did make one important innovation: He persuaded Nimitz and Lockwood to station submarines off target islands to rescue downed aviators. This greatly improved morale as well as reducing losses of highly trained aircrew.